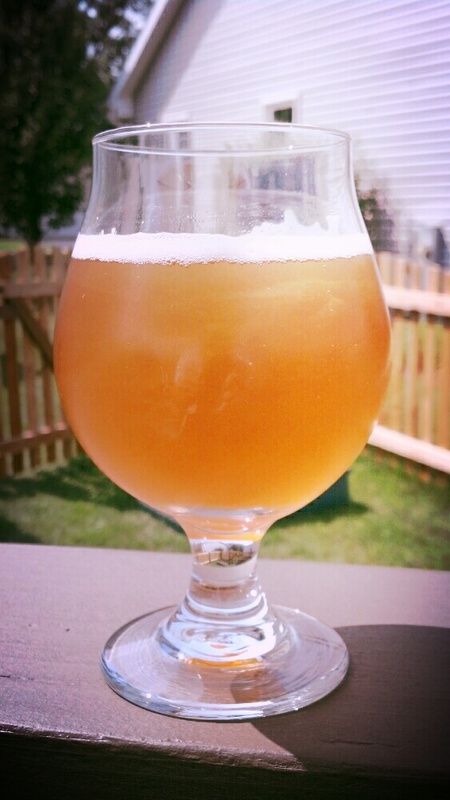 This beer was my newest DIPA Recipe, and one of the best beers I’ve brewed. There’s room for improvement, but mostly just in my process. This beer was brewed in the beginning of July, and I’m still enjoying it now. I’ve been trying to brew my ideal IPA recipe for a while. I realized that I’d be happier brewing a Double IPA on the lighter side of the style. I’m planning on doing a post about my quest for the perfect IPA, and to sum it up here, I leaned towards a beer in the Vermont Style of IPAs. Unfortunately I haven’t had a chance to try beer such as Heady Topper, Double Sunshine, and Abner, but from what I’ve read they seem to possess all the things in an IPA that I like. I found clone recipe for Heady online, and started getting ideas for this beer. I was able to find a DIPA yeast made by a local yeast lab called Omega. The yeast is apparently the same strain as Conan, the yeast used in Heady. Another DIPA I love is Abrasive by Surly. Its got such great mouthfeel, and I’m sure it comes from its use of oats. So, I combined elements of Abrasive and Heady Topper. The brew day was the first in the new house. It was also my first nighttime brew. My new neighbors came over to hang out with my wife and I and we had a ton of fun brewing this beer. Probably too much fun, as I feel my process was sloppy on this one, and it led to some last minute scrambling to hit my OG. I realized I didn’t have caramalt, so I subbed in the quarter pound of crystal 10 I had. I did my 60 minute boil, then did a 30 minute hop stand with the huge flameout hop addition. I then chilled, aerated, and dumped it into my bucket. I either didn’t boil off as much as I anticipated, or I just added to much mash or sparge water. Either way, I had more wort than I expected after the boil, and my OG was well under what I wanted. If I recall, I wanted 1.074, and I came in at 1.065 or something along those lines. I thankfully had some DME and more corn sugar on hand. I added about half a pound of DME, and another quarter pound of corn sugar. I got the OG up to 1.070. I fermented at 65 degrees for a week, then let it come up to room temperature to finish out for another week. I added my dry hop with five days to go till bottling. Since I wound up adding more corn sugar than I originally intended, the FG of the beer was lower than I expected. I wound up at 1.011, and I was hoping for 1.014. So, I still hit right around the 8% abv i was looking for, but the beer turned out dryer than I intended. Still, this was easily one of the best beers I’ve brewed. Appearance: This was a pretty beer. It turned out just a hint lighter because of the crystal 10 sub for caramalt, but its pretty negligible. It was that nice orange color that I’d been trying to get my IPAs. Conan yeast, oats, wheat, and tons of hops left the beer pretty cloudy. To be honest though, I really like a nice hazy IPA. Aroma: Huge dank and citrus hop aroma, I loved it. No real floral notes, which I was glad about. I can smell this beer after I pour it from halfway across a room. I love the fruity aromas that the Conan yeast gives off. Taste: I love the way this combo of hops came together. Its citrusy, dank, and has just a hint of pine. The hop flavor was great, and the bitterness was smooth. I would have liked just a bit more malt sweetness, but as I said the beer dried out more than anticipated. I love the peach like notes the Conan gave off. Mouthfeel: It was a bit thinner that I’d hoped, but the oats still lend a silkiness to the beer that I liked. Overall: Despite having a couple of problems to overcome, this beer turned out great. I’ll brew this again for sure after I run out. I’ll be anxious to try to hit my numbers to get a bit more body and just a touch more sweetness. UPDATE 09/04/14: I finally was able to get a hold of some cans of Heady Topper, and I’ll be damned if this beer wasn’t in the ballpark. I wasn’t going for a clone, since to my knowledge there is no Citra in Heady, but this beer was close. I plan to brew this beer again soon, and I plan on just using Pearl malt as the base, the same base malt as Heady. I figured why not just simplify the grain bill? As for this beer, it got darker as it eventually cleared up. Its now a deep gold/light copper color and pretty clear. The hops of faded and the beer has more balance to it. Its still really good, but I can’t wait to brew a fresh batch!